WASHINGTON -- Eyeing the end of his presidency, Barack Obama urged Americans Tuesday night to rekindle their belief in the promise of change that first carried him to the White House, declaring that the country must not allow election-year fear and division to take hold. "The future we want," he insisted, "is within our reach." But opportunity and security for American families "will only happen if we work together ... if we fix our politics," he added. The nation's goals must include "a rising standard of living and a sustainable, peaceful planet for our kids," he said in his final State of the Union address. 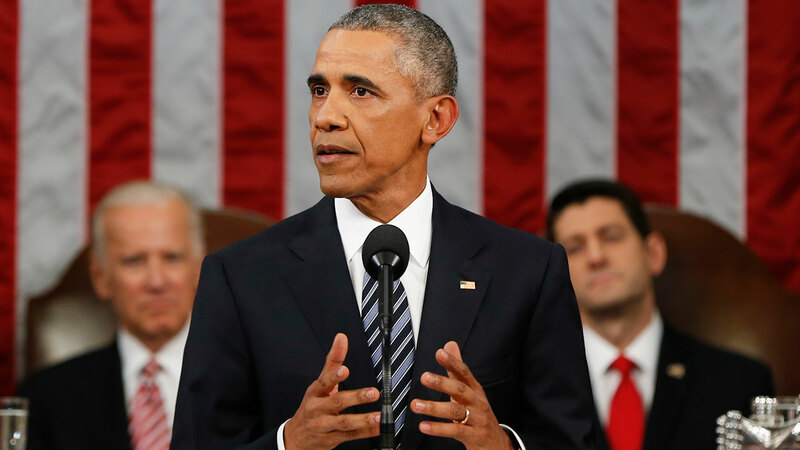 At the heart of Obama's address to lawmakers and a prime-time television audience was an implicit call to keep Democrats in the White House for a third straight term. Sharply, and at times sarcastically, he struck back at rivals who have challenged his economic and national security stewardship, calling it all "political hot air." In a swipe at some Republican presidential candidates, he warned against "voices urging us to fall back into tribes, to scapegoat fellow citizens who don't look like us or pray like us or vote like we do or share the same background." His words were unexpectedly echoed by South Carolina Gov. Nikki Haley, who was selected to give the Republican response to Obama's address. Underscoring how the heated campaign rhetoric about immigrants and minorities from GOP front-runner Donald Trump in particular has unnerved some Republican leaders, Haley called on Americans to resist the temptation "to follow the siren call of the angriest voices." "No one who is willing to work hard, abide by our laws and love our traditions should ever feel unwelcome," Haley said in excerpts released ahead of her remarks. Seeking to shape his own legacy, Obama ticked through a retrospective of his domestic and foreign policy actions in office, including helping lead the economy back from the brink of depression, taking aggressive action on climate change and ending a Cold War freeze with Cuba. He vowed a robust campaign to "take out" the Islamic State group, but chastised Republicans for "over the top claims" about the extremist group's power. "Masses of fighters on the back of pickup trucks and twisted souls plotting in apartments or garages pose an enormous danger and must be stopped," he said. "But they do not threaten our national security." The president's words were unlikely to satisfy Republicans, as well as some Democrats, who say he underestimates the Islamic State's power and is leaving the U.S. vulnerable to attacks at home. Obama was frank about one of his biggest regrets: failing to ease the persistently deep divisions between Democrats and Republicans. "The rancor and suspicion between the parties has gotten worse instead of better," he conceded. "There's no doubt a president with the gifts of Lincoln or Roosevelt might have better bridged the divide, and I guarantee I'll keep trying to be better so long as I hold this office." Mindful of the scant prospect for major legislative action in an election year, Obama avoided the traditional litany of policy proposals. He did reiterate his call for working with Republicans on criminal justice reform and finalizing an Asia-Pacific trade pact, and he also vowed to keep pushing for action on politically fraught issues such as curbing gun violence and fixing the nation's fractured immigration laws. Yet Obama was eager to look beyond his own presidency, casting the actions he's taken as a springboard for future economic progress and national security. His optimism was meant to draw a contrast with what the White House sees as doom-and-gloom scenarios peddled by the GOP. "The United States of America is the most powerful nation on earth. Period," he declared. "It's not even close."